Here is a mani that I wore last week. It was the first time I had worn aEngland Princess Tears, and because it has been raining and cold, I knew I wasn't going to get to see much of the holo effect. So I decided to stamp it. I stamped using Layla Mirror Effect polish in Purple Diva. I originally starting stamping on my right hand using Layla Mirror Cosmo Lilac, but the colour difference was almost impossible to see (I wanted subtle, not invisible), so after one finger I switched colours. Purple Diva was just dark enough to show on top of Princess Tears. I really, really loved wearing this mani. 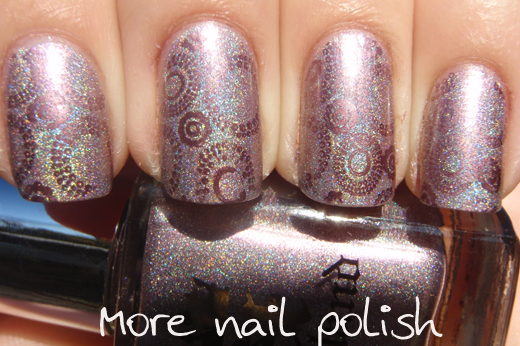 I'd never done a really subtle stamping before, I'd only done strong contrasts with black or white for example. 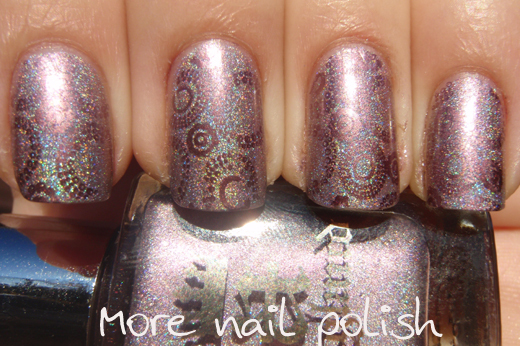 This was so pretty and give the mani something interesting indoors when the holo effect wasn't really visible. I really like the look! What stamping plate did you use? Oh crap, I've no idea what plate it is. It's really big, and has a D in the bottom corner, but nothing else written on it. I bought it several months back from You Mix Cosmetics, but they don't have them anymore. I love that effect - it looks etched instead of stamped - quite unique looking. This is very pretty and sophisticated! Can wait for those new BM plates! This turned out great! I've been doing tone on tone stamping for a while now and love how my manis turn out, they look more sophisticated to me somehow, like yours here. 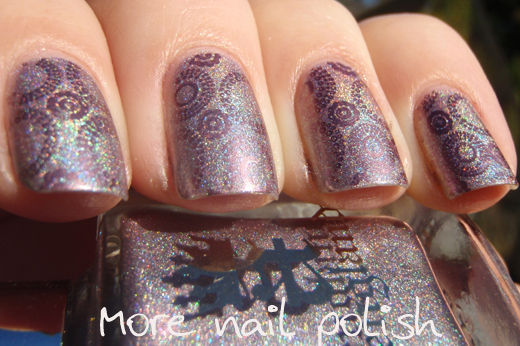 Oh yes, I've seen your stunning tone on tone stamping, your stamping is always so perfect and such an inspiration to me!